8×10” acrylic and canvas panel. It was cloudy and still but what we see is just a starting point. 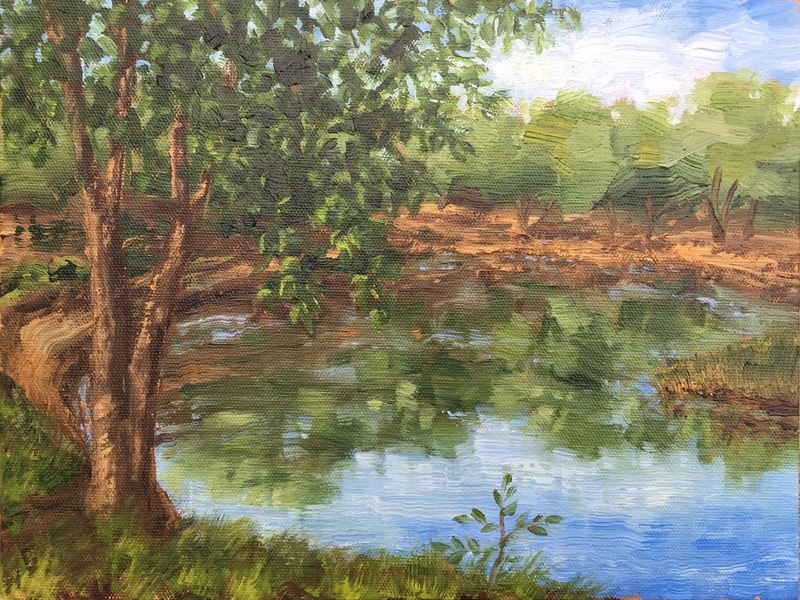 Sometimes unexpected result come from Plein Air painting. This photo shows how I embellished the scene. Mainly I added a field beyond the horizon for more interest, more elements that are simplified in the foreground. I waited for a sky I wanted to paint, I normally do that first. I saw a fabulous sunset this summer on our trip to Michigan. I had to paint it! I’ve rarely painted anything like this. I want to paint a bigger one, this one is 9×12” on canvas board. I sold the painting on Facebook to an old friend who grew up appreciating the Lake Michigan Sunset. On a cool dreary day, I painted along the shore of the river. Painted Poppies first in the open air and sunshine, and then in the studio.